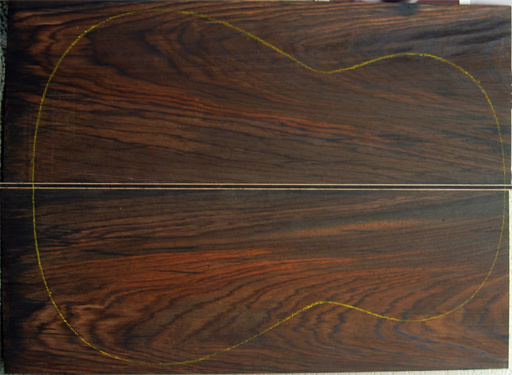 L arry has stocked a large selection of excellent wood, including a special cache of old Brazilian rosewood, Dalbergia Nigra . 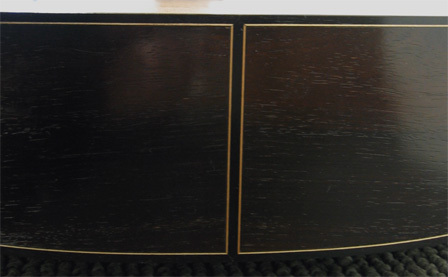 This is the dark Jacaranda set we selected. The wood is mostly slab-cut, thick and astonishingly heavy. Ink-black spider webbing flows slightly perpendicular from center with amazing orange figuration. 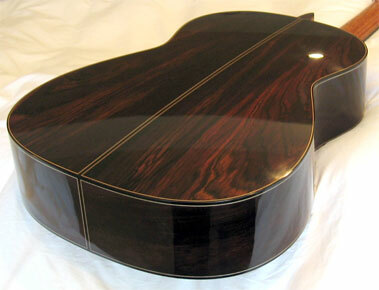 W ords cannot express the mysterious beauty of this wood. I expect it will resonate with gusto, helping project ringing harmonics that are dark and bright all at once. 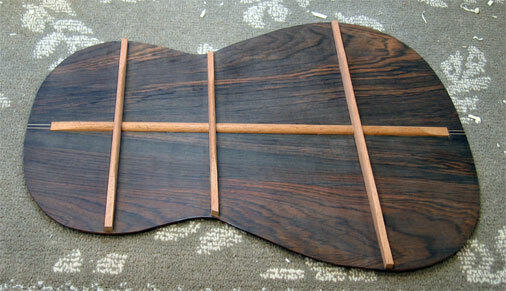 The ebony perfling has already been joined; the white trim is maple. 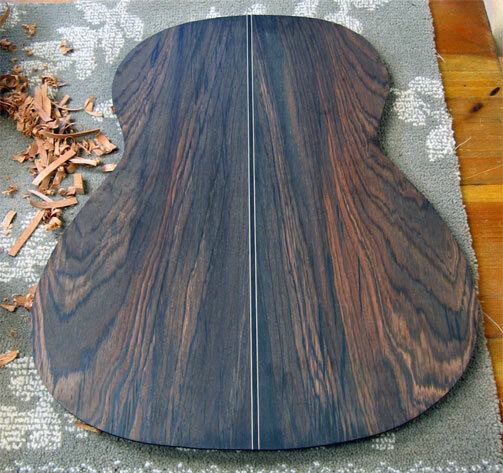 Ebony will be used extensively, including for the fingerboard and headstock veneer. T he deep orange figuration is very dramatic. 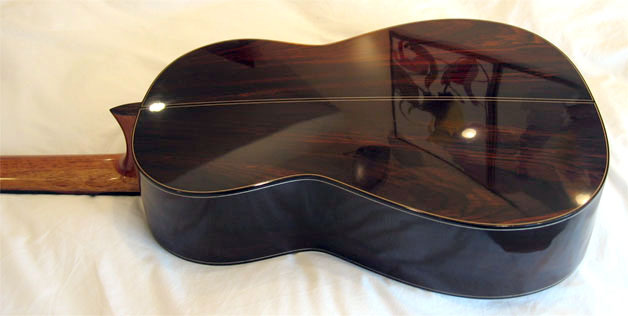 The guitar will look just like it sounds: strong and dark, yet capable of contrasting brilliance as well. 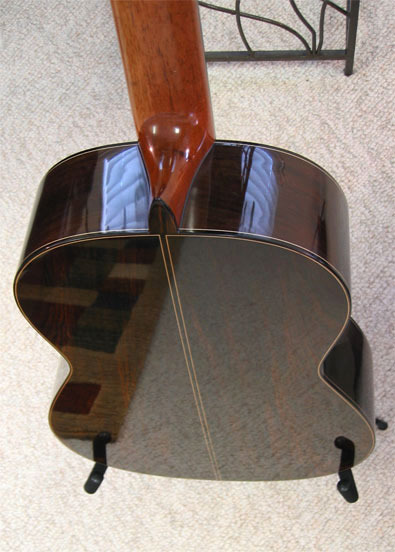 T he guitar's double-top design is matched with double-side construction. 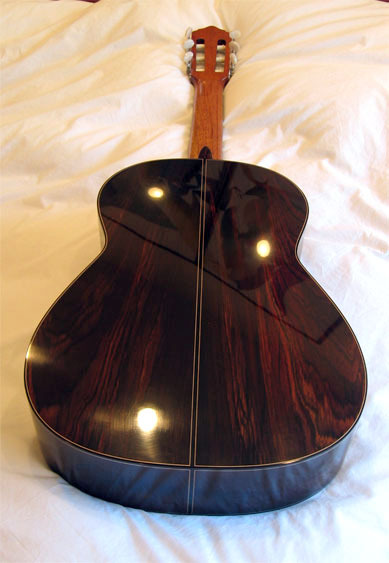 Breslin's design is a lighter version of the same technique used by Jose Ramirez III. 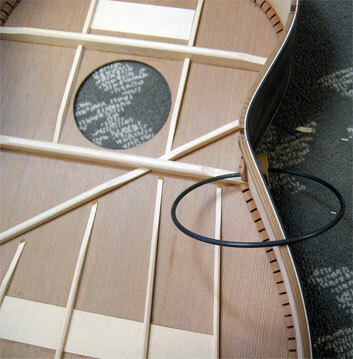 Doubling the sides insures a very rigid frame that delivers more energy to the soundboard. 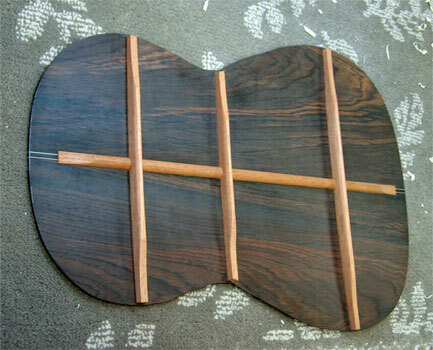 Brazilian rosewood and Spanish cypress ribs ( Cupressus Sermpervirens ) will be joined. 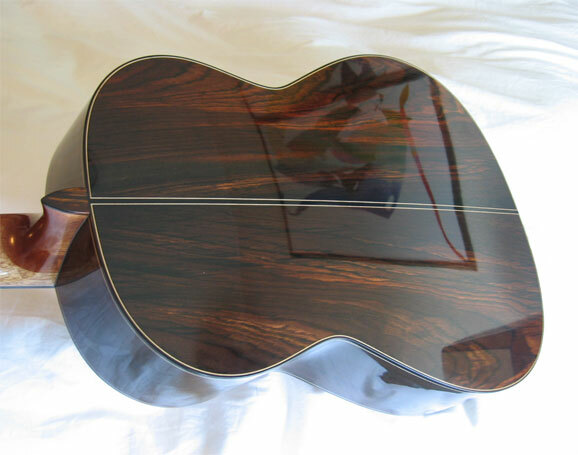 L arry usually reserves Spanish cypress for his Flamenco instruments. However, he generously agreed to use some of his remaining cypress for the ribs. Larry acquired the wood during a visit to Granada, Spain. I love the smell of cypress! 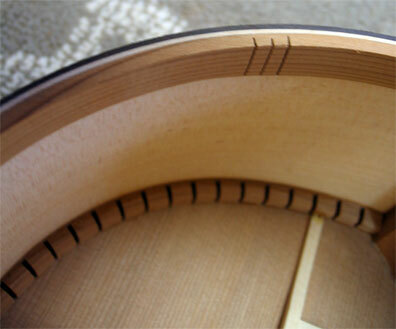 A few more photos of the sides follow, showing more spider webbing and moderate figuration. 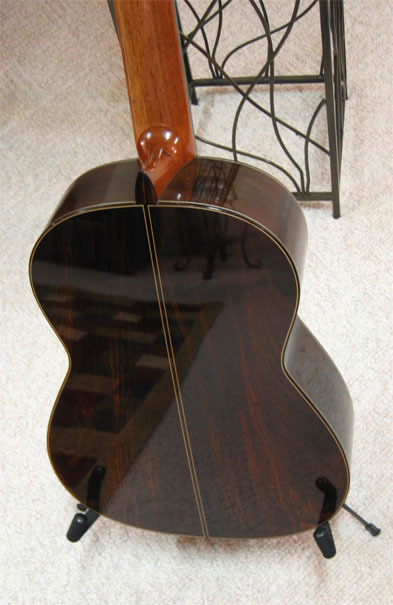 Larry selected a dark set that compliments the back. This wood should remain stable, unlike recently harvested stump wood. 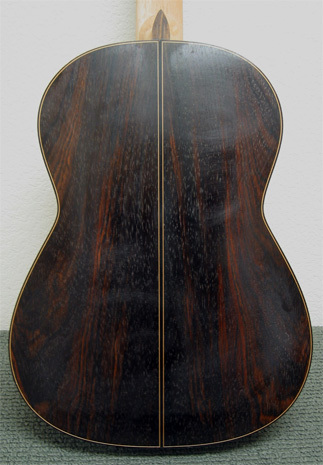 Doubling the sides not only increases strength, it also reduces the inherent stabilization risks associated with Brazilian rosewood. 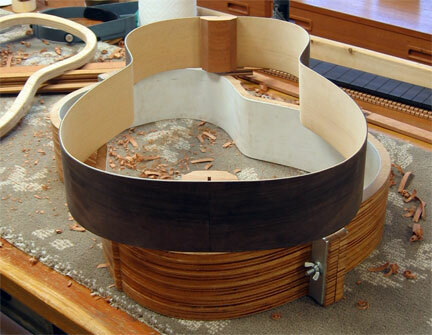 B efore bracing, the back is cut and sanded to approximate dimensions. The intense web figuration never fails to amaze me. T his is a heavy resonating engine. 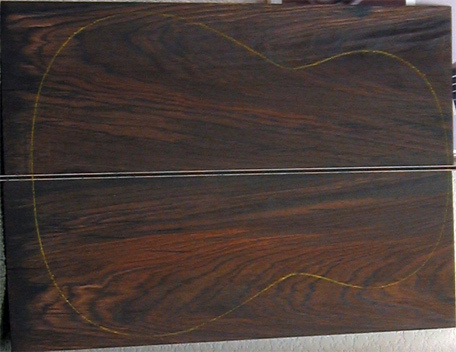 Thick cuts of Cuban cedar ( Cedrela Odorata ) are used to brace the back. The braces are curved to create just the right amount of lateral back arch. T he braces are fully shaped and sanded. 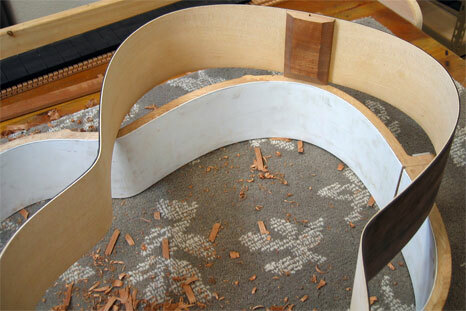 They are beveled but not scalloped, tapering down sharply at each end. L arry's center brace has evolved from wide and thin to a narrow and thicker design. T he back is now fully braced. 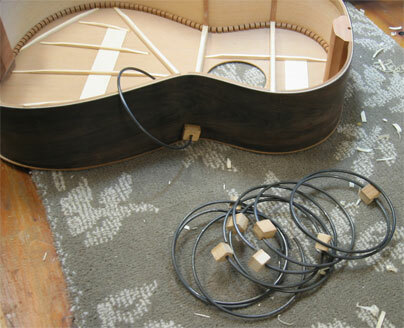 It is ready to be joined with the body. 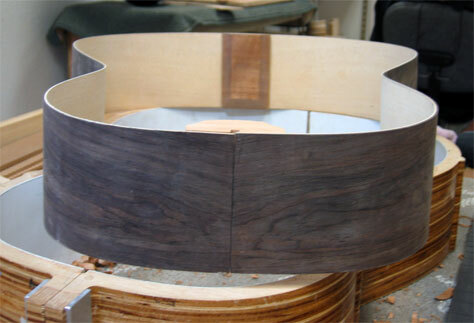 T he side wood has been thinned, shaped and joined. After sanding, a spray bottle is used to wet each side as they are shaped with a heated bending iron. 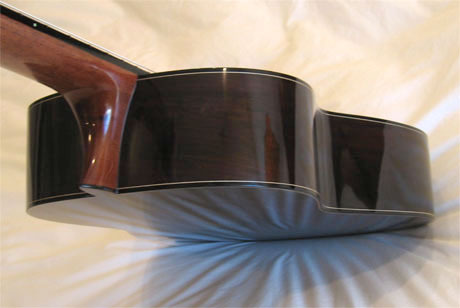 Aluminium frames are used to join the sides. 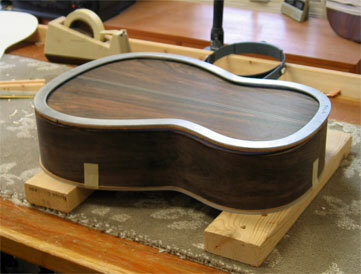 Finally, the sides are set in a jig and the end blocks are glued in place. 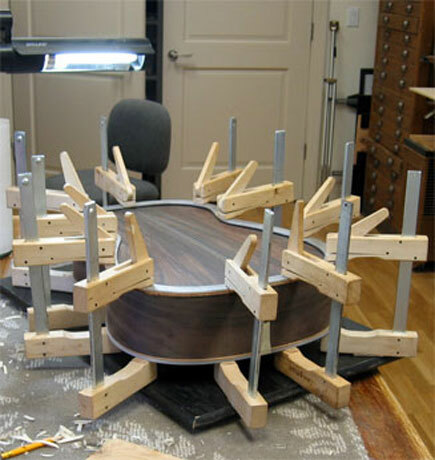 T he sides are resting atop the jig used to glue the sides to the end blocks. 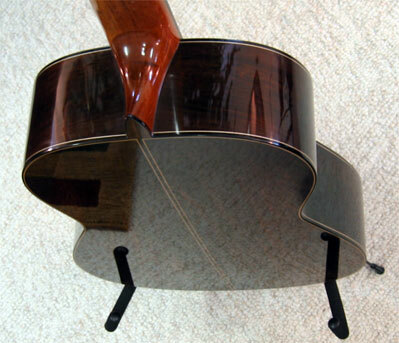 This jig is also used to fit the top and back. L arry skillfully shaped and joined the sides. 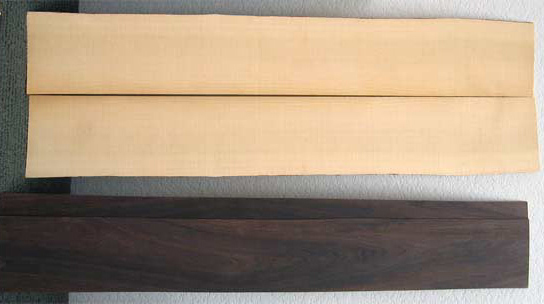 The contrast-based design is evident once again, as dark Rio and cream-colored cypress are united. 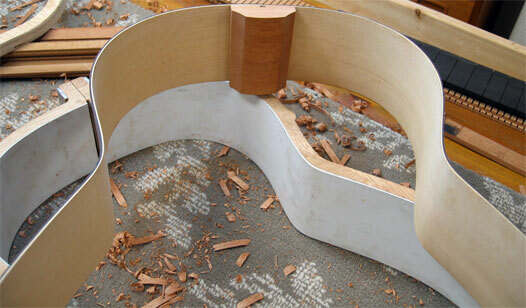 T his image provides an excellent opportunity to observe how carefully Breslin measures the height and angle of the sides and end blocks, adjusting the curve until an ideal amount of longitudinal and latitudinal back tension/bow is created. C ypress inner ribs dominate this image. 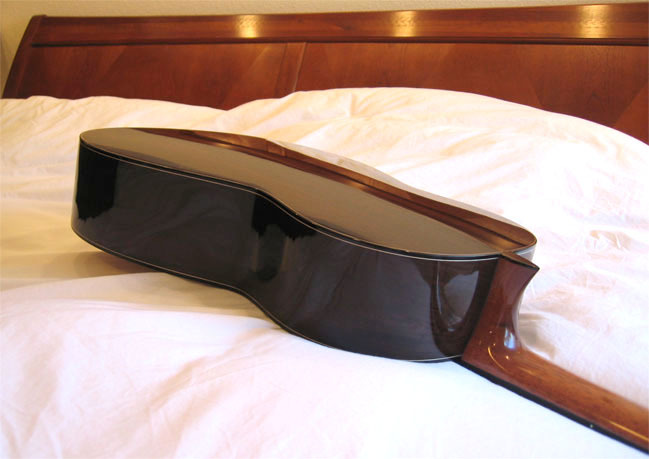 The sides are built like a Ramirez concert guitar, but Breslin prefers thinner/lighter construction. For deeper coverage of Breslin's side-bending process, please visit my side bending page. M ahogany is used for the heel block. Breslin's design has evolved from Ignacio Fleta, who rejected the need for a foot/boot. 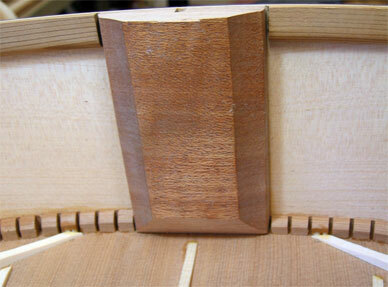 A pilot mortise has already been cut for the upcoming neck join. Attention to detail is evident everywhere. 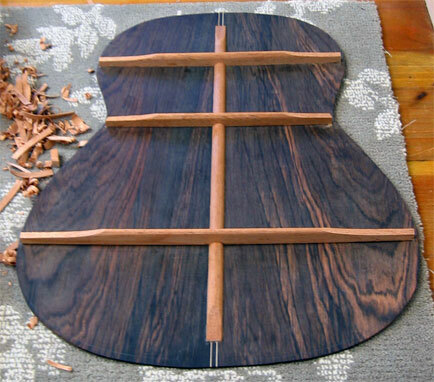 For example, Larry elegantly shapes each block using a special sander, even though very few will ever notice this kind of devotion. 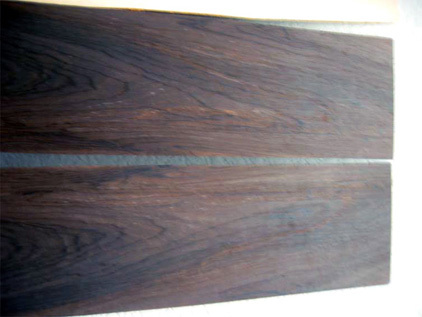 M ahogany is also used for the tail block. T he tail block is much thinner than the heel. 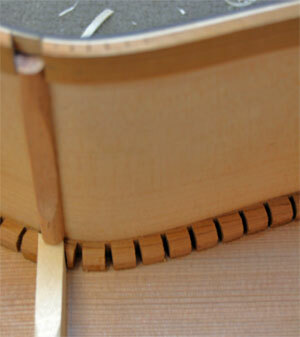 S olid cedar lining is used to brace the sides that bond with the back, creating a strong and rigid join. 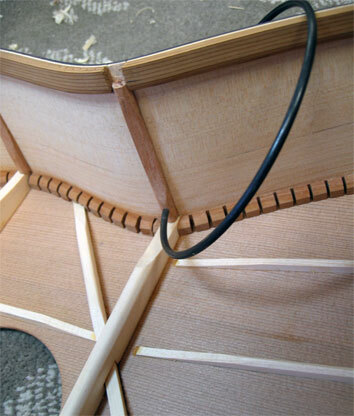 This bracing technique greatly lowers the number of kerfs; they appear only where necessary to maintain a tight join. 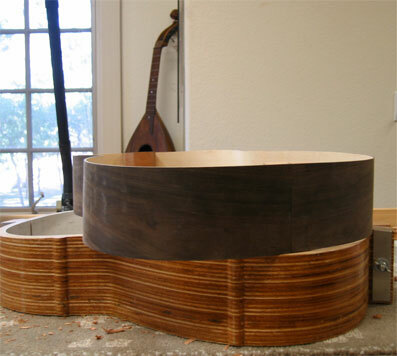 The lining is carefully shaped to match each side, insuring a solid union. 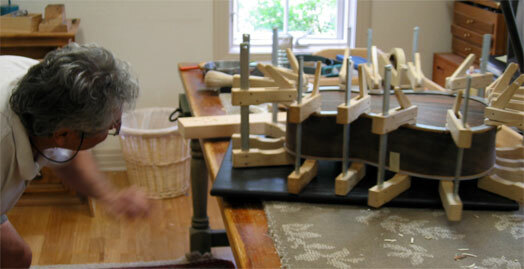 T hese heavy bed springs have been converted for use as side clamps! 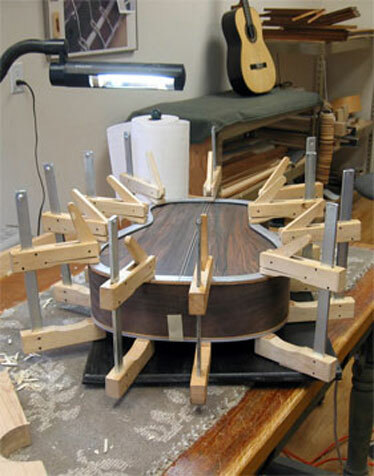 Three clamps are used for each side brace. T he springs are just the right size for the job, producing the correct amount of clamping power. 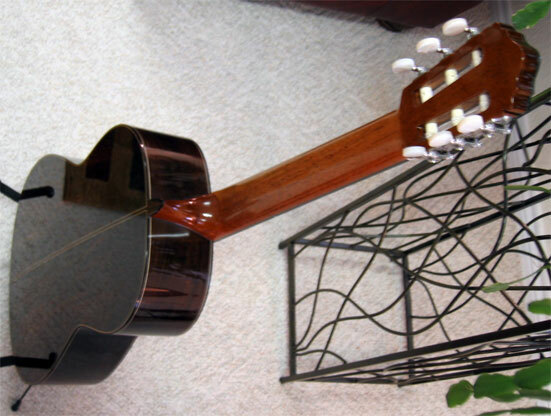 This simple yet exceptionally creative idea expresses Larry�s masterful synthesis of the practical and cutting edge. 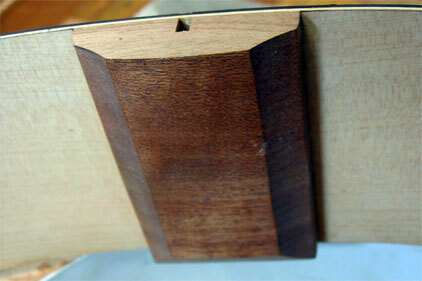 E nd plugs are attached to protect the side wood and increase clamp pressure. 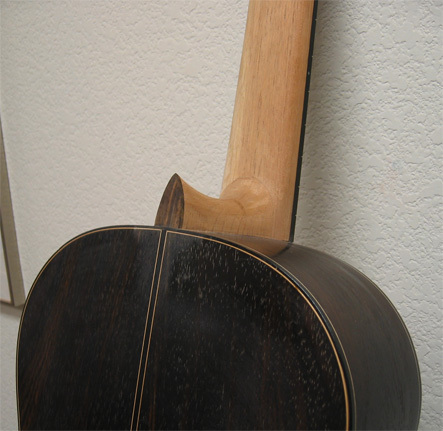 C uban cedar is used for all side bracing. They are the only braces that are heavily scalloped. 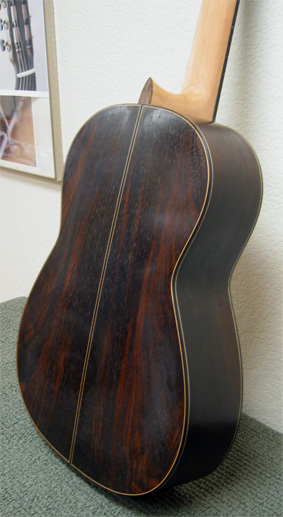 S ide kerfs can be seen at major stress points along the waist, keeping the solid cedar lining firmly united with the sides. A dditional kerfs appear at the upper and lower bouts. 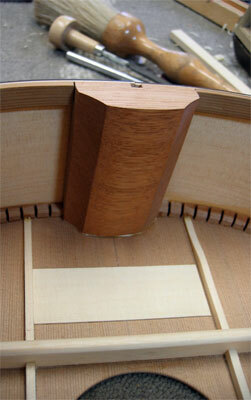 S ide bracing at the waist in detail. 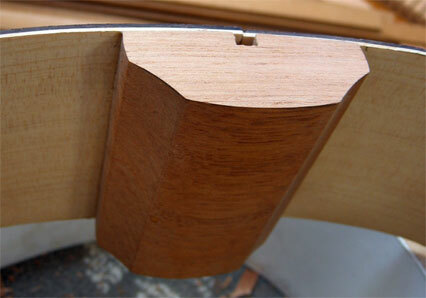 P artial side bracing is used in the lower bout. H eel block bracing is now complete. T his is a fully braced tail. T he back can now be joined to the body. 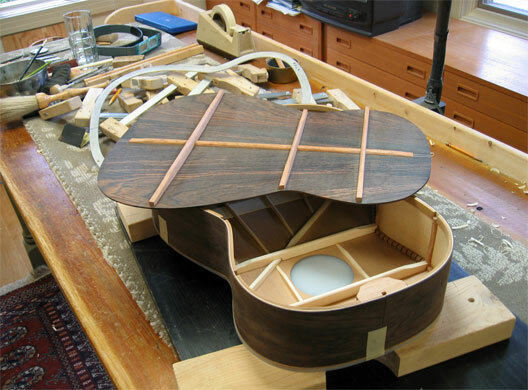 B racing forms are placed around the instrument. 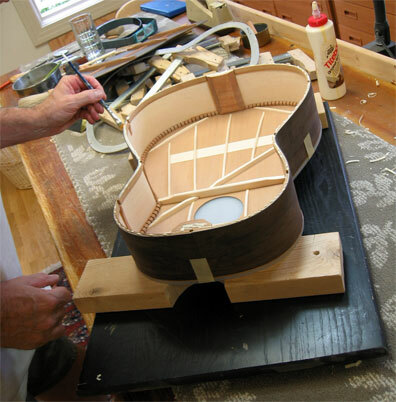 The back is tested by dry-joining it with the body one last time before any glue is applied. 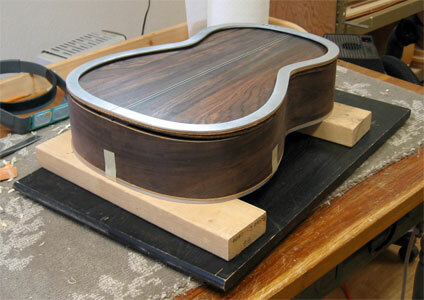 The steel body template has a cork backing to protect the wood and evenly distribute clamping pressure during the join. 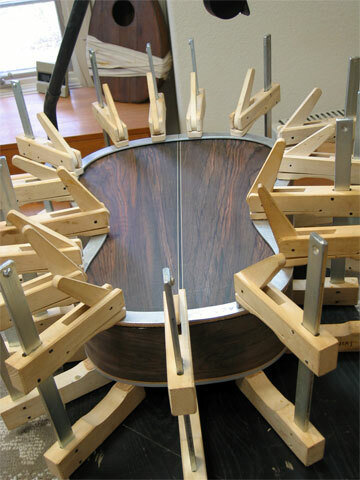 A Lazy Susan is used to allow fast access to any position during the clamping process. As the image shows, the height of the sides is not uniform. 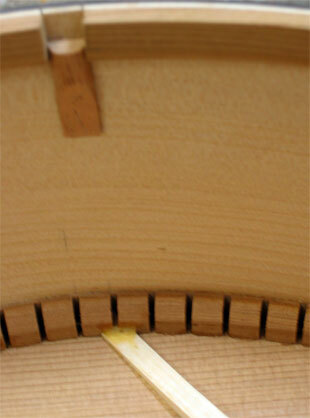 The sides are curved to create back bow/tension in all directions, generating more energy. 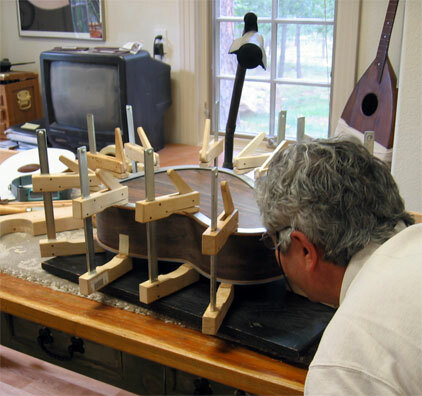 These are critical measurements that insure optimum resonating performance. G lue is applied evenly with a small paint brush. 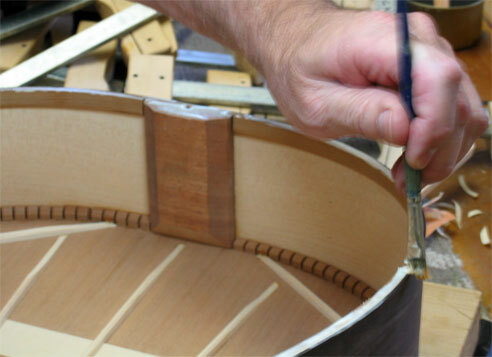 A painter's medium fan brush is used to insure the glue is spread uniformly across all surfaces. F ast brush work is required because the glue sets quickly. 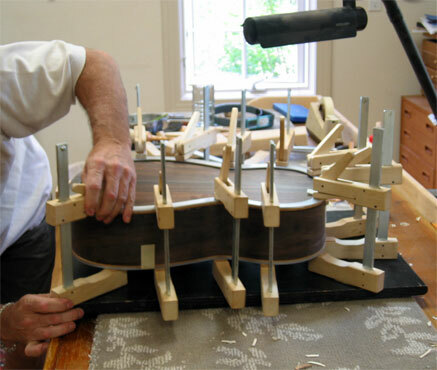 S everal Swiss clamps are used to join the back. Larry told me he acquired all the clamps during a trip to Sweden a few years ago. 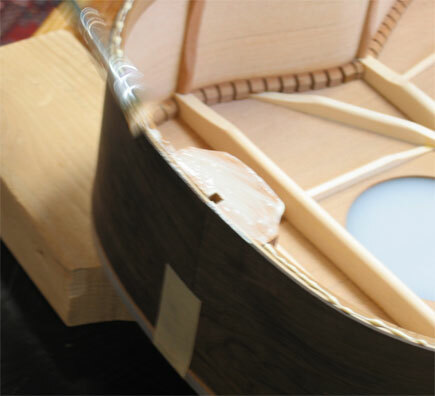 Clamping pressure is carefully adjusted at several points along the join. 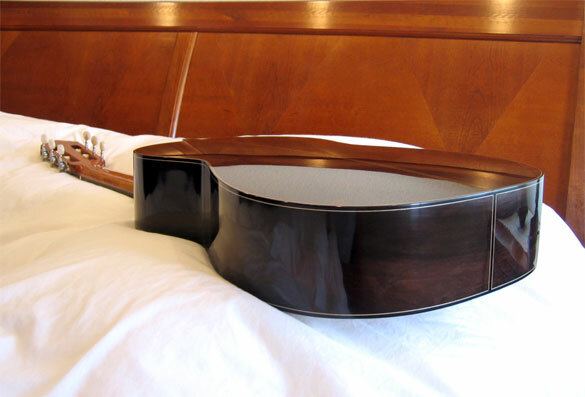 A strong piece of plexiglass protects the soundboard. 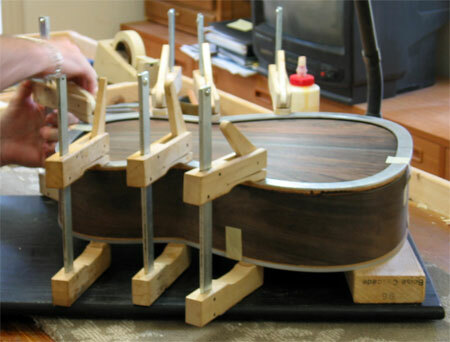 T he clamps are placed starting at the waist/side, then the heel and finally the tail. L arry carefully inspects the entire join, increasing or decreasing clamp pressure accordingly. 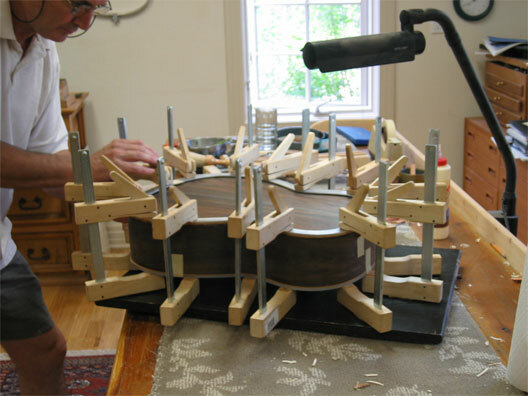 T he Lazy Susan really helps speed the initial clamping and subsequent inspection process. 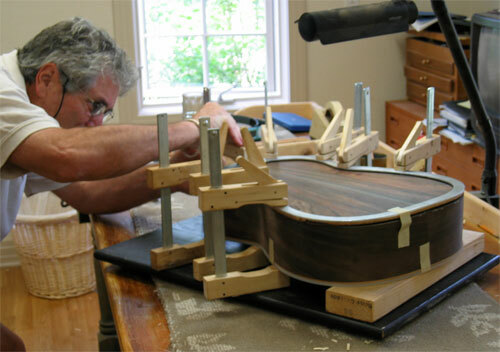 S ixteen clamps are required to complete the job. 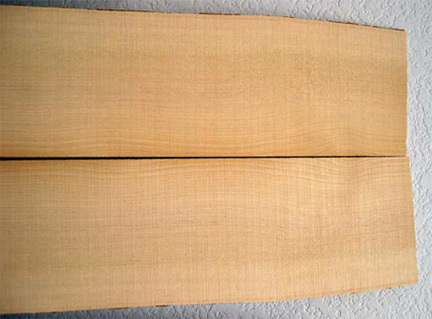 H eel-to-tail bowing is visible in this image. A side-to-side bow can be seen in this photo. The binding and trim work comes next. 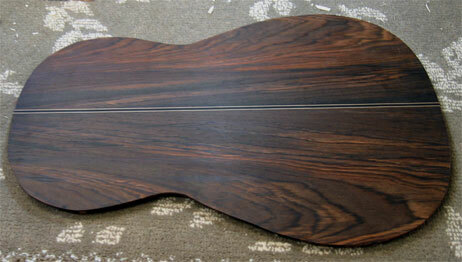 N eck and binding work is finished now. 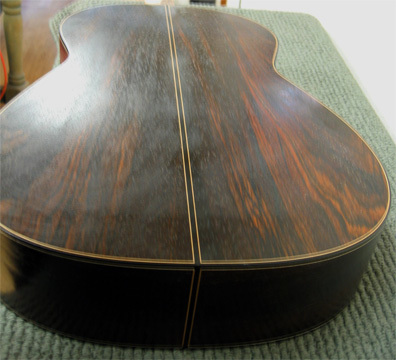 A seal coat of shellac has been applied to the entire body, darkening the rosewood. 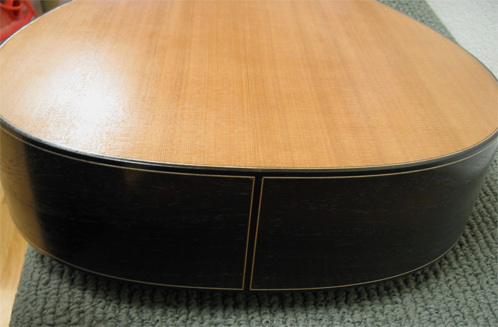 This initial application provides a good bonding surface for the final finish and helps protect the binding. 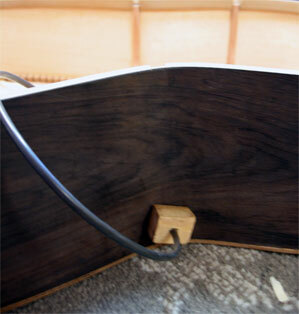 A very thin coat of Nitrocellulose lacquer will be applied next. 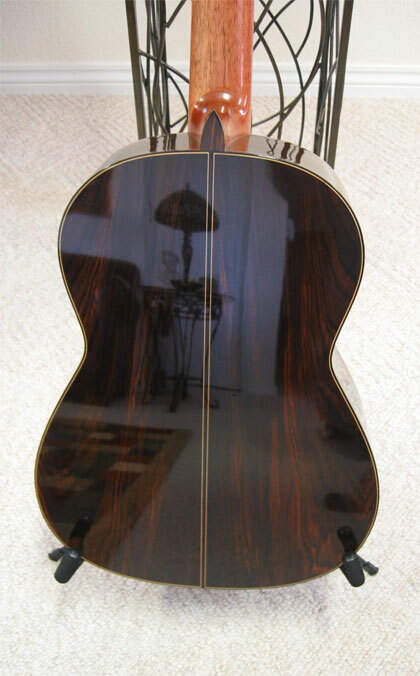 Like the rosette, I decided on a traditional binding design that emphasizes darkness with contrasting trim. 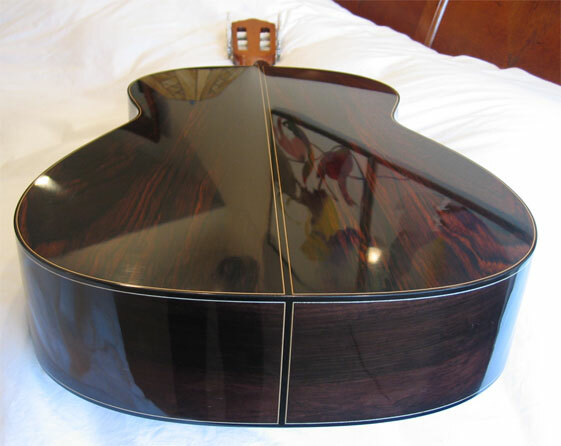 The body was bound using ebony with maple trim to achieve this goal. 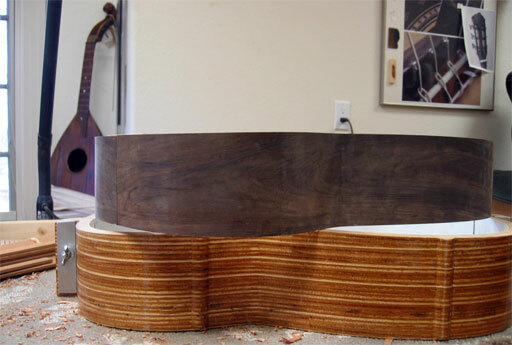 The tail work is beautiful and required several mitered cuts. 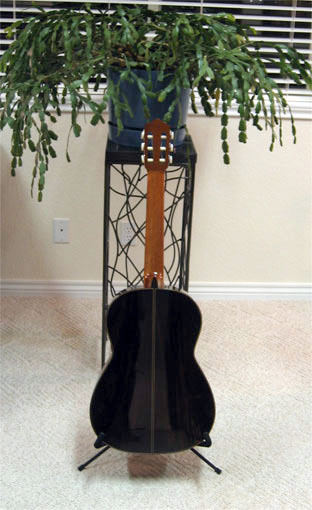 A fter five months of work the guitar is finished! 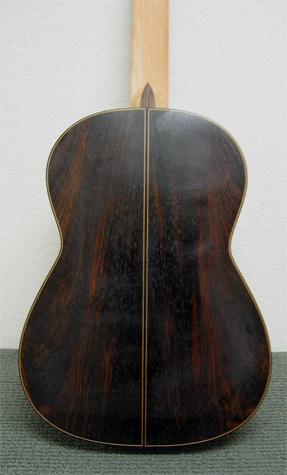 The following series of photographs focus on the instrument's back and sides. They document Breslin's excellence.